A great write up on Nagtroc from Tekknikal.This was going to come out sooner or later. Mizuno definitely has a thing for Americans. The culture clash is there. Japan and the US has different ways of doing things. Not understanding the culture and preferences of a particular market can cause problems. And then I had to ask. "Will it be coming to America?" He had mentioned the US several times in his presentation, but I wasn't surprised by his answer. I wanted him to elaborate and hold no punches: "What are your thoughts of the American market?" "America is not ready." He responded. I nodded. 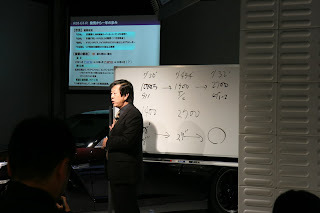 Mizuno-san then proceeded to point to all the points on the car where the body and chassis were reinforced. He described how the forces impacted the roof of the car. He explained that the structural rigidity of the car would be compromised if the roof were simply replaced with a carbon fiber panel. 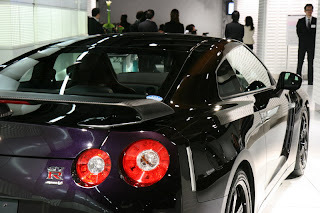 I then asked Mizuno-san why the car was called SpecV, as opposed to VSpec. His answer? His statement really bothers me, I wonder why america is not yet ready? It bothers me too. Its just the attitude of some Japanese. They think the car is too sophisticated for the US market, in some ways it might be. I think at first the car was planned for the US, but the whole thing with the transmissions left a bad taste in their mouth. It doesnt have to do with the Japanese not liking us but the fact that, in America, there is a stigma with brand names and price. People who have $175,000 wont want to spend "that kind of money on a Nissan." The same way people are hesitant to spend $40,000 on a Hyundai Genesis Sedan because its a "Hyundai." The domestic market in Japan knows the weight of the GT-R name and will shell out the cash just like an American will do the same for a Viper, even though it says Dodge and not Chrysler. It doesnt make sense financially for them to bring the car over and have no one buy it. It just makes smart business sense for a company who had to cut 20,000 workers. I agree...America is not ready. I agree. Smart move. Real enthusiasts who want the car can shell out the extra couple thousand to have it properly imported. Nissan just isn't a "supercar" brand here in the states. It wouldn't sell well and Nissan would be out all of the cash they diverted to production for America and import to America where they would be better served by selling first and foremost to their very loyal Japanese customers.